Insect Monitoring, Mating Disruption and Control Systems | Trécé, Inc.
Trécé is a leading American innovator focused on customer needs, growing through development, manufacturing and marketing of insect pheromone and kairomone-based products, which benefit food production and the environment, while creating net economic welfare for its customers, company employees, local and global communities. 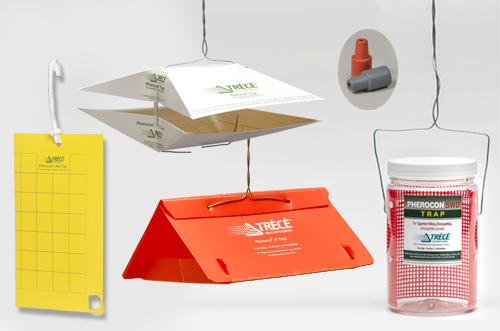 The Trécé product catalog currently contains over 150 species-specific, pheromone and/or kairomone-based monitoring and control systems, attractants and lures, a full line of trap models designed for a wide variety of flying and crawling insect pests that attack growing agriculture and post-harvest stored ag crops. These products are marketed under two internationally respected brand names, PHEROCON® and STORGARD®. Trécé created, registered and markets a line of insect control products under the brand name, CIDETRAK®, for orchard, vine and row crops and protection of post-harvest stored ag products in the commodity, food processing and retail segments of the industry. The company also produces CIDETRAK® gustatory stimulants, which are mixed with insecticides to entice feeding by targeted pests, as well as other specialty products. To obtain additional information if needed, for example SDS Sheets – contact Trece’s customer service. Trécé’s leading-edge pest monitoring and control products provide farmers and pest managers with the simple, easy-to-use tools they need to implement an integrated pest management solution. Trécé’s PHEROCON® line of species-specific, pheromone-based kits, attractants, lures and traps; and its CIDETRAK® line of mating disruptants have become industry standards for protecting orchard and field crops from a wide range of insect pests. PHEROCON® The World Standard for Effective Monitoring. 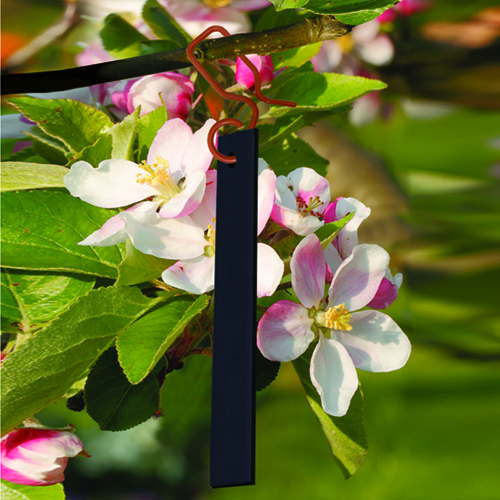 CIDETRAK® CM Puzzle Piece for Codling Moth, Cydia pomomella, in Apples, Pears and Walnuts – Made to Withstand the Elements. 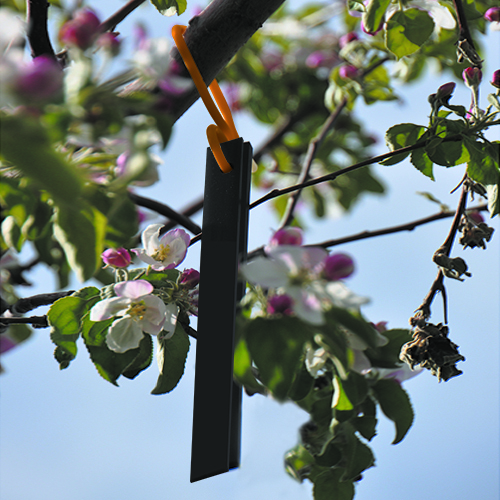 We are proud to bring you our original innovation, the CIDETRAK CM Puzzle Piece, an intelligently simple performance dispenser for Codling Moth control. 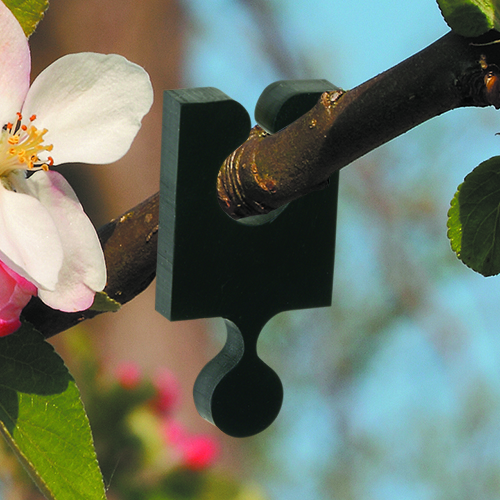 CIDETRAK® CM-OFM COMBO™ Puzzle Piece for Codling Moth, Cydia pomomella and Oriental Fruit Moth, Grapholita molesta in Apples, Pears, Walnuts, Stone Fruit and other tree crops. CIDETRAK CM-OFM COMBO mating disruption dispensers contain a unique combination of Codling Moth pheromone AND Oriental Fruit Moth pheromone. With this COMBO you get a “2-for-1” you cannot beat with this High Performance dispenser. 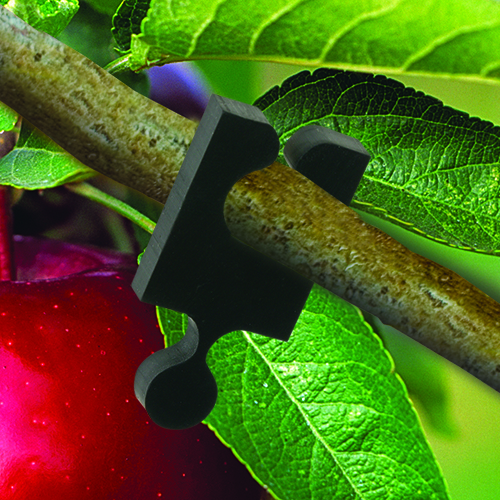 CIDETRAK® CMDA COMBO™ Puzzle Piece Codling Moth, Cydia pomomella in Apples, Pears and Walnuts. CIDETRAK CMDA COMBO high-performance mating disruption dispensers contain a unique combination of Codling Moth pheromone AND a patented male AND female behavior modifying kairomone called DA (pear ester). These are the only products in the world that disrupts the mating of male and female Codling Moth delivering a significant “one-two” punch! CIDETRAK® CMDA COMBO™ MESO™-A for Codling Moth, Cydia pomomella, in Apples and Pears. CIDETRAK CMDA COMBO MESO-A mating disruption dispensers contain a unique combination of Codling Moth pheromone AND a patented male AND female behavior modifying kairomone called DA (pear ester). These are the only products in the world that disrupts the mating of male and female Codling Moth delivering a significant “one-two” punch! 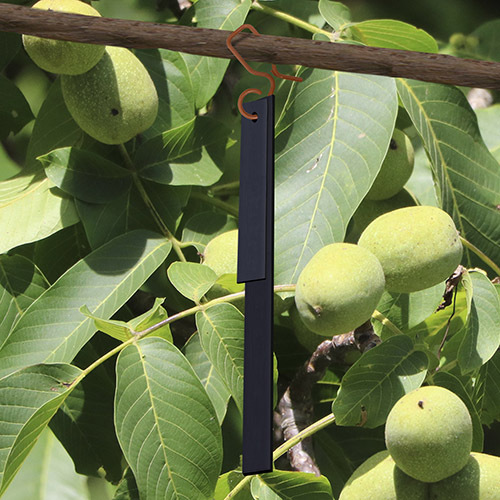 CIDETRAK® CMDA COMBO™ MESO™-W for Codling Moth, Cydia pomomella, in Walnuts. CIDETRAK CMDA COMBO MESO-W mating disruption dispensers contain a unique combination of Codling Moth pheromone AND a patented male AND female behavior modifying kairomone called DA (pear ester). These are the only products in the world that disrupts the mating of male and female Codling Moth delivering a significant “one-two” punch! 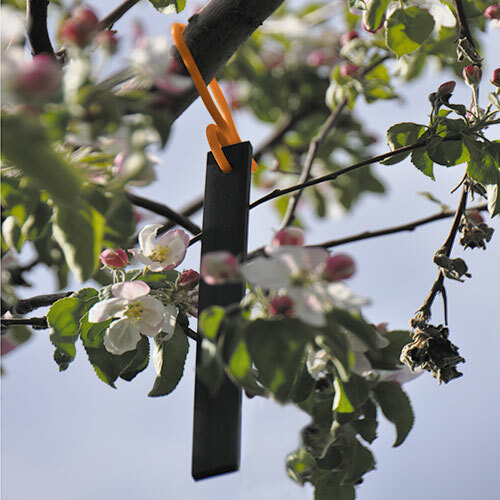 CIDETRAK® CMDA + LR Dual MESO™ for Codling Moth, Cydia pomomella, and Pandemis Leafroller, Pandemis pyrusana, and Oblique Banded Leafroller, Choristoneura rosaceana in Apples, Pears and Stone Fruit. CIDETRAK CMDA + LR Dual MESO mating disruption dispenser (Dispenser A) contains a unique combination of Codling Moth pheromone AND a patented male AND female behavior modifying kairomone called DA (pear ester), Now, we have included a potent pheromone dispenser for the control of Leafrollers (Dispenser B) to be added to the same easy-to-use patented, high performance rotating hook-hanging device. With the added Leafroller pheromone, you get a “2-for-1” performance you cannot beat for both Codling Moth and Leafroller control. These are the only products in the world that disrupts the mating of male and female Codling Moth delivering a significant “one-two” punch! 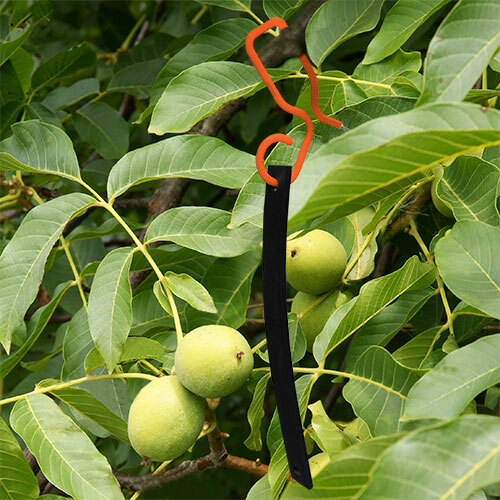 CIDETRAK® CMDA + NOW MESO™ for Codling Moth, Cydia pomomella, and Navel Orangeworm, Amyelois transitella in Walnuts. CIDETRAK CMDA + NOW MESO is a high performance, dual mating disruption dispenser for Codling Moth and Navel Orangeworm control in walnuts. Dispenser A contains a unique combination of Codling Moth pheromone AND a patented male AND female behavior modifying kairomone called DA (pear ester). And, Dispenser B contains a potent Navel Orangeworm pheromone which is to be added to the same easy-to-use patented, high performance rotating hook-hanging device. It is the only mating disruption product on the market approved for organic use. With the added Navel Orangeworm pheromone, you get a “2-for-1” performance you cannot beat for both Codling Moth and Navel Orangeworm control. These are the only products in the world that disrupts the mating of male and female Codling Moth delivering a significant “one-two” punch! CIDETRAK® CMDA + OFM MESO™ for Codling Moth, Cydia pomomella, and Oriental Fruit Moth, Grapholita molesta in Apples, Pears and Stone Fruit. CIDETRAK CMDA + OFM MESO is a high performance, dual mating disruption dispenser for Codling Moth and Oriental Fruit Moth control in apples and pears. It contains a unique combination of Codling Moth pheromone AND a patented male AND female behavior modifying kairomone called DA (pear ester), as well as a potent Oriental Fruit Moth pheromone. With the added Oriental Fruit Moth pheromone in the same dispenser, you get “2-for-1” performance you cannot beat for both Codling Moth and Oriental Fruit Moth control. These are the only products in the world that disrupts the mating of male and female Codling Moth delivering a significant “one-two” punch! 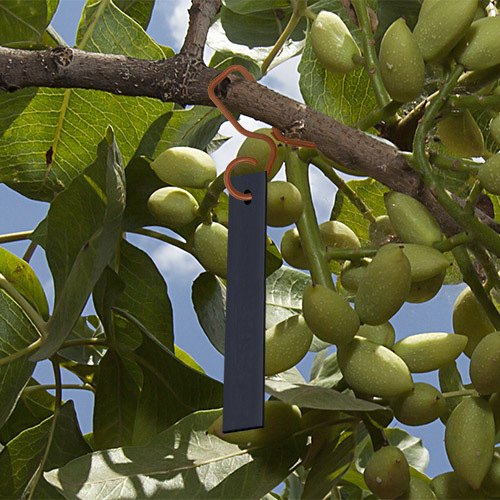 CIDETRAK® NOW MESO™for Navel Orangeworm, Amyelois transitella, in Almonds and Pistachios. CIDETRAK NOW MESO is a high performance mating disruption dispenser for Navel Orangeworm control in almonds and pistachios. Benefits include: significant reduction in trap capture; reduction in mating; significantly reduced damage with proper management program! CIDETRAK® OFM-L MESO™ for Oriental Fruit Moth, Grapholita molesta, in Stone Fruit and Pome Fruit. CIDETRAK OFM-L MESO is a high performance mating disruption dispenser for Oriental Fruit Moth control in stone fruit and pome fruit. Benefits include: significant reduction in trap capture; reduction in mating; significantly reduced damage with proper management program! 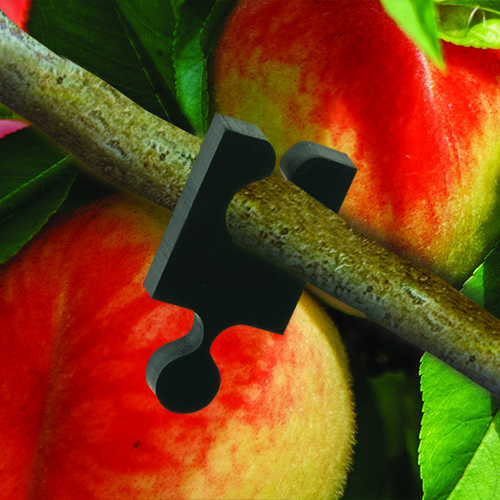 CIDETRAK® OFM-L Puzzle Piece or Oriental Fruit Moth, Grapholita molesta in Stone Fruit and Pome Fruit. 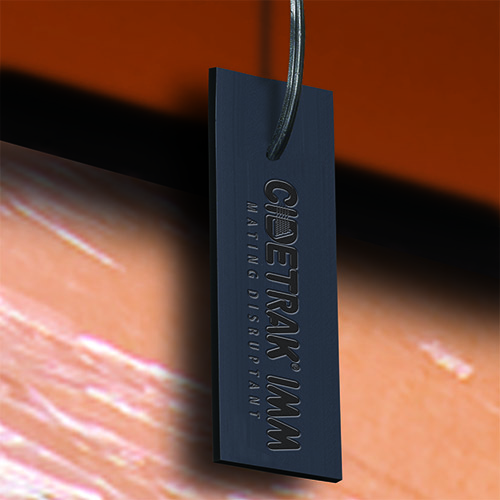 CIDETRAK® DA MEC for Codling Moth, Cydia pomomella, in Apples, Pears and Walnuts. 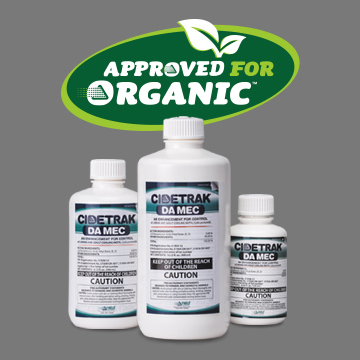 CIDETRAK DA MEC contains a novel, patented kairomone in a microencapsulated liquid formulation that influences the behavior of adult and larval Codling Moth, resulting in significant enhancement of the control of Codling Moth larvae, when tank mixed with various insecticides based on increased exposure of the Codling Moth larvae. 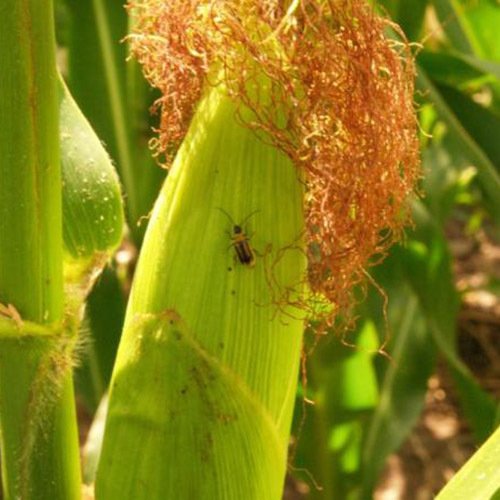 CIDETRAK® D Gustatory stimulant for Corn Rootworm, Diabrotica spps. Trécé’s storage monitoring and control products are specifically designed to provide a non-toxic, low-impact solution for stored goods protection. 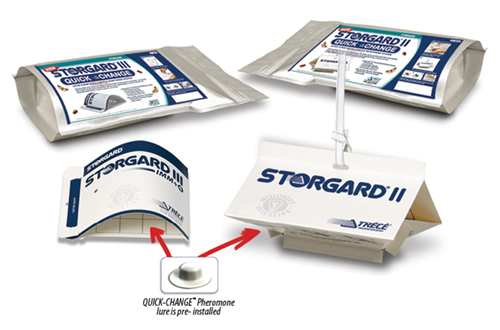 Customers around the world rely on Trécé’s industry-leading STORGARD® product line to provide early warning of potential insect infestations—and to Trécé’s innovative CIDETRAK® IMM mating disruptant technology to reduce larvae and damage to stored goods. 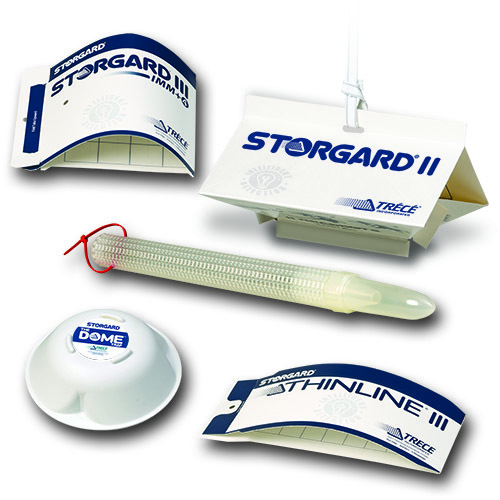 The STORGARD QUICK-CHANGE monitoring product line provides pre-baited, multi-species, cost-effective methods for detecting moth AND beetle activity at the earliest possible stages. CIDETRAK® IMM for Indian Meal Moth, Plodia interpunctella, Tobacco Moth or Cocoa Moth, Ephestia elutella, Raisin Moth, Cadra figulilella, Almond Moth, Cadre cautella, and Mediterranean Flour Moth, Ephestia kuehniella, in stored products. The CIDETRAK IMM Dispenser Technology provides a 3-way effect on mating that dramatically reduces larvae and damage to stored goods. CIDETRAK IMM used with a reduced, or without an insecticide program (depending upon insect abundance), provides a continuous preventative strategy for at least 5 species of moths. Over time, CIDETRAK IMM is often more effective than insecticides and is completely non-toxic (EPA CFR 40 Approved) and can be used on all stored organic products.